Some of my greatest joys as a blogger have been working with indie brands to design polishes. My mind is constantly racing with ideas for finish, glitter, and color combinations, and I'm so thankful for the special people that help me make some of those ideas real. Today I'm proud to share the Pretty & Polished Blogger Collection with you, a group of 5 polishes that have all been designed with the help of bloggers. I am lucky enough to have been one of the ones to collaborate. Let's take a look! P.S. Don't miss the giveaway! You can enter to win a set at the end of the post! 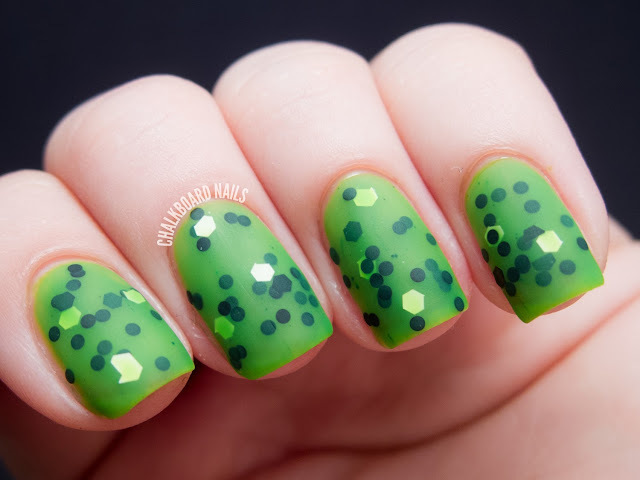 Me, Myself, and Cacti is the polish that I worked on with Chels. This neon green jelly was inspired by the heat of summer and all of the cacti we have here in Arizona. Of course, I couldn't let the opportunity go by without including black and white glitter! I love the way this turned out, it's so bright and juicy. The amount of glitter is perfect, too! I've used three thin coats here. I also couldn't resist mattifying it. I used OPI Matte Topcoat; doesn't it make the polish look like a rubber bouncy ball? Crazy Circles is the brainchild of Crystal from Crystal's Crazy Combos. It begins with a slightly grey-tinted white base, adds holo sparkle, and finishes with a bunch of circle glitters. The holo sparkle in this, though hard to capture in a photograph, is really lovely and adds great dimension. Because of the large glitters, I would give the polish a few extra minutes to dry in between coats. I used three coats here. Adventures In Polish Making represents Amy from I'm Feeling Nail-venturous. This medium grey base is accented with smaller blue and purple glitters. It's a quiet glitter polish, perfect for those days when you want something a little more simple without sacrificing sparkle. I used three coats here but it really only needs two. New York City Lights was created with Carly from Lacquered Lover. This polish is made up of purple microflakes that flash blue in the light. It reminds me of a snow cone, or crushed candy. Alone, this polish can be worn at three coats for an etheral look. I've also tried layering one coat over black to show off the "evening" side of this polish. Queen You Dig It? was created with Shipra from Taneja's Bride. Is it weird that I almost like this one more than the one that I helped create? It's so pretty. The creamy base has bright blue hexes, smaller maroon glitters, and a gorgeous gold flake sparkle. It has a kind of graceful, antiqued quality that is really beautiful. I used three coats. This collection is being launched at 6pm EST today. I want to extend a thank you to Chels for inviting me to participate, it was such a fun process and I'm so pleased with the result. There's more! Pretty & Polished has generously offered to provide a set of these polishes for a giveaway. Please enter using the Rafflecopter widget below. Must be a follower of Chalkboard Nails to win. Must be 18 years of age or older, or you must have your parent's permission to enter. This giveaway is open internationally, and closes on July 10, 2013. The winner will have 48 hours to claim their prize, after which a new winner will be chosen. New York City Lights is sooooo pretty as a layering polish! Queen You Dig It? is gorgeous! I definitely need to get that one. Myself and Cacti looks incredibly fun - like a cartoon for nail polish! further myself into polish debt! oh my GOSH HOW COOL is crazy circles?! I wonder how difficult it would be for us regular people to apply, however. Haha, it was a little tricky, just take your time and go slow! And I would also recommend two coats of topcoat at the end, too. Aw thank you! I think you will enjoy them if you end up picking some! I love Me, Myself and Cacti! I have an obsession with black and white glitter too, and green is one of my favourite polish colours! Aw, thanks! But really, your polish is just so pretty and refined! Ah really??? Did you enjoy it? Wow, you did an amazing job with Me, Myself and Cacti! Such a creative name, and the execution is flawless. And you're right, mattified it totally looks like a rubber bouncy ball. Loving Me, Myself and Cacti - it reminds me of a kiwi fruit! Also, I tried to be all clever when answering the "describe your perfect polish" entry, but totally failed when my pinky fingernail accidentally slipped up and hit Enter. Rafflecopter needs a quick-fix feature! My answer was supposed to be "Automatically changes to match my outfit, and never chipped. ;P" A girl can dream! I seriously love all of these polishes! And I love the idea of bloggers collaborating with an indie polish maker. I have yet to add an indie to my collection, ordering online isn't possible for me right now. One day! Congratulations on being able to make that awesome polish! I love these soo much! I love Crazy Circles & Adventures in Polish Making the best! And the one you created Sarah reminds me of a kiwi! I'm loving Crazy Circles and Me, Myself, and Cacti (with an Oxford comma, no less! The geek in me rejoices), but really there isn't a single polish in this collection I wouldn't wear. Good stuff. I usually don't like matte, but Me, Myself, and Cacti matter looks just like a boucey ball like you said and I LOVE IT!!!! Have ordered your Cacti and can't wait to wear it way down here in NZ! Looks fab! My favorite is Me, Myself and Cacti. That green jelly is gorgeous.